Since it's the middle of the summer and people keep messaging us asking for the next give aways, we have decided to do a series of big give aways, starting today, the 21st of July. There will be multiple Give Aways you can enter, you can choose to enter some or to enter all. The prizes you win are all very exciting. 1. One RP card with 5000 RP to 5 lucky winners. 2. One hour of free coaching to 5 lucky winnners . 3. 50 Referrals to 3 lucky winners. 4. One RP card with 15 000 RP + 2 hours of free coaching + one random free guide to 1 lucky winner. How to enter: The first competition is one we have had before with great success.To enter the give away you only need to Purchase a Guide off our website and Rate and Comment on the guide you buy. You can purchase the one you want from our Guide Section, read it and rate it. Once that is done, you are automatically entered into this competition. Timeline: The competition will run from the 21st of July (from you receive this email) until the 11th of August. Winners announced: The winners will be announced the 12th of August, one day after the competition ends. They will be annoucned in our News Section and all winners will receive an email with instruction on how to claim their prize. 1. $300 in Store Credit to be used on anything on our website to 1 lucky winner. 2. 5000RP to 5 lucky winners. 3. 1 hour of free coaching to 5 lucky winners. 4. 2 hours of free coaching to 5 lucky winners + a free random guide. How to enter: All you need to do to enter this competiton is to purchase 1 hour of coaching from any of our coaches. Remember to Rate and Comment after your lesson is completed. Once you have done this, you are automatically entered into the competition. 1. A free boost from Unranked to Diamond V for the start of next season to 5 lucky winners. 2. A free 1 Division Boost to 3 lucky winners. 3. 7200 RP to 5 lucky winners. 4. 5 games with a team of boosters and coaches (all D1 - Challenger) to 5 lucky winners. You will be playing and learning from them, and you can choose if you want to play normals, ranked 5s or anything else. You can also choose the times you play. How to enter: To enter this competition you need to purchase $50 or more worth of Boosting orDuoq from our website between the time you receive this email and the 11th of August. Once that is done you will be automatically entered into the competition. Below you can find informtion on how to rate your guide purchase. Login to your LoLBoost.net account. Click on My orders then on Guide orders. Then you will see your guides as shown above. Click View Guide, the button on the right. When you have clicked View Guide, this will open. Click Rate. 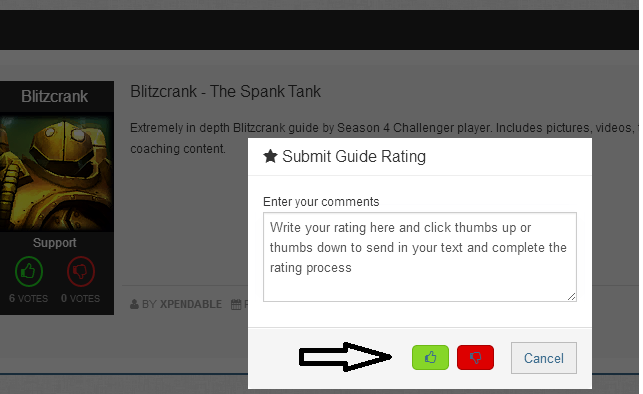 Now write your rating in the box and click thumbs up or thumbs down to submit your rating. Good luck everyone. Remember to check your email and follow the news post the 12th to see what you win!